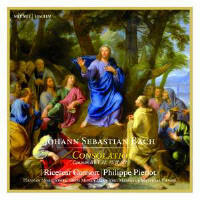 Consolation is, of course, a prevalent conceit in Bach’s expressive armoury (as dictated by the cyclical requirements of the church calendar) and Philippe Pierlot inhabits it with perspicacious zeal in highly engaged readings of three magnificent cantatas. They are pieces over which Bach clearly took considerable trouble, including the first cantata he presented for audition in Leipzig and the inaugural work on his appointment soon after. On this evidence, such levels of thematic programming gratifyingly resolve the potential knottiness of listening to one Bach choral work after another. Die Elenden sollen essen represents his debut cantata as an employee, and in its scale and ambition it must have made a serious impression on parishioners. While Pierlot opts for a single-voice choir, such is the questing intensity of the rounded palate of voices and instruments that even those for whom one-to-a-part Bach isn’t to their taste will not fail to be won over. The devil’s in the detail with the Ricercar Consort, as you can hear in the exquisite tenor aria, ‘Mein Jesus soll mein alles sein’. The power of its singular rising motif provides an obsessional longing, not dissimilar to ‘Ach mein Sinn’ in the first version of the St John Passion, and as gloriously believable as you’ll hear. Indeed, the key to the success of these readings is that while they are rooted in transparency, they are vibrantly resonant, boldly directional and never brittle. The arias tend to portray the singers as primus inter pares with the obbligato instruments as real partners in the dialogue; and if the singers’ coloratura is not always convincing, the relationships between Pierlot’s deeply felt, strongly rhetorical and sinewy lines always prevail. How exceptionally the opening of Jesus nahm zu sich die Zwölfe conveys the heavy-hearted Jesus as he tries to prepare the uncomprehending disciples for the journey to Jerusalem and his death. It’s a masterpiece of imagery and Pierlot has its full measure. Just when you feel it cannot improve, the Ricercar Consort present a cantata of the most profound poignancy. Death was never far away in Bach’s family – an orphan at 10, widower at 35, and 10 infant deaths – and Jesu Christ, wahr’ Mensch und Gott traverses the experience like few others in Bach’s oeuvre. The pizzicato funeral bells of the soprano lullaby are among many delights, with Emmanuel Laporte’s oboe-playing representing the golden thread in a lovingly conceived and executed project.